Coolers are wonderful for family outings. A day at the beach, the park, a sporting event or even a trip to an amusement park. 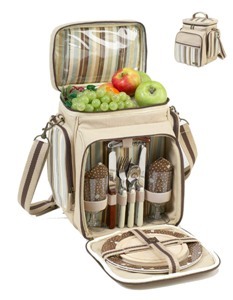 If you are going on a long trip, it's best to bring one cooler for beverages/drinks and a separate cooler for food. The reason is because beverage coolers are opened frequently, allowing cold air to escape. Coolers with food will stay colder longer because they will be opened less frequently. Depending on the length of your trip/day out, a separate cooler with extra ice will help you to replenish ice in food and beverage coolers. Wash all perishable foods, such as fruits & vegetables before you leave home. Pack all foods in air tight bags or sealed plastic containers - this helps prevent cross contamination and a mess. Ice packs are available in many different sizes and styles. For the softer coolers, we advise that you DO NOT put loose ice in the food coolers. The reason for this is simple, the sharp edges of the ice can rip the lining and ice melts faster and makes the cooler heavy and misshapen. In order to prolong usage of your cooler, it must be taken care of. Beverage cooler tips: Pre-chill beverages before placing them in the cooler. Pre-cooling preserves ice, so you will need less ice to cool drinks down. Since cold air travels down, place beverages in the cooler first and ice last. If possible, try to keep your cooler out of the sun/ out of a hot car. Try finding a shaded area to keep your cooler. Food cooler tips: To keep food cold long weekend getaways, several ice paks are best. Or you can use a block of ice. This will keep food cold for a longer period. Always place ice-paks/ice blocks at the bottom of the cooler. Always pack perishable foods directly from the refrigerator into the cooler. Keep foods dry and safe from cross contamination by placing in air tight bags or sealed plastic containers. Again, we suggest using several ice-paks. Also, to fill up the spaces, put a couple of small water bottles in your freezer the nigh before. Place frozen bottles in the gaps. Immediate ice paks PLUS extra water if you get thirsty! Keep hot foods warm. Coolers can be used for cooling AND keeping foods warm. We highly recommend the following to keep your foods warm: purchase some ice-pak/hot-paks. These paks will help keep your food warm. Once you have heated your food – wrap it up in tin foil and then place the hot-paks (please read instructions on heating) on top. If there are any spaces, cover your food with a kitchen towel. Wrap hot bowls containing hot foods with more towels and then carefully place in the cooler. Try filling up spaces with kitchen towels - not allowing for empty space will help keep foods hot. - A full cooler will maintain safer temperatures longer than a half empty cooler. - Thaw items in the refrigerator or cooler, do not thaw meat at room temperature or in the sun. - Keep perishable foods in cooler until just before serving. Wash cooler with warm soapy water. To sanitize cooler, we suggest spraying the inside with an equal mix of water and white vinegar. Leave lid on cooler OPEN to air dry. This is important - if you close your cooler whilst damp, there will be an odor. Some coolers come with a removable liner. Remove liner and wash with warm soapy water. Again, make sure the liner is completely dry before placing back in the cooler. Which cooler do I choose...? 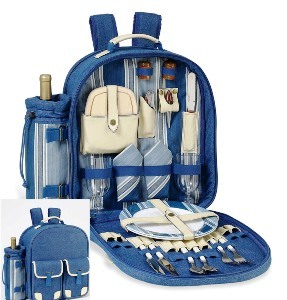 The backpack cooler combos are great for picnics, a day at the beach, camping or hiking... The best thing about these backpack coolers is that they have a dry section at the top for your "dry" goods and an insulated bottom section for your food and/or beverages. Next time you bring the family to the fun fair or amusement parks, save your money (and your tummy) by packing healthy sandwiches and crunchy snacks for you and the kids. The Picnic Coolers are fully loaded, meaning they have all the accessories required for a picnic day out such as glasses, plates, napkins and so on. Pack some yummy cheeses, crackers and your favorite wine and have a great day out with your family and friends. The Insulated Cooler Totes are really stylish and classy, with many colors and styles, and are ideal for the ladies. Excellent for the farmers market, going grocery shopping or a day at the beach. Some of these bags are so stylish they can be used as an everyday bag! 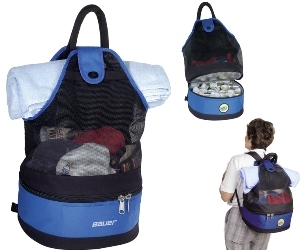 The Coolers on Wheels are ideal for traveling. The wheels are easy to roll and you can get quite a lot of food in the insulated main compartment. The rolling Musicoolers are ideal for that special beach trip or vacation. Some customers use them to transport their food, some love taking them on their business conventions. They also collapse for easy storage. These radio coolers are an excellent treat. And finally, the trendy party coolers. Fill with your favorite drinks, top with ice and enjoy the party! Basically all coolers serve the same purpose. They cool or keep foods warm AND look fashionable and stylish at the same time! Sofia Romano has the popular website KeepYourCooler.com.